The ugliest picture of the most delicious thing. 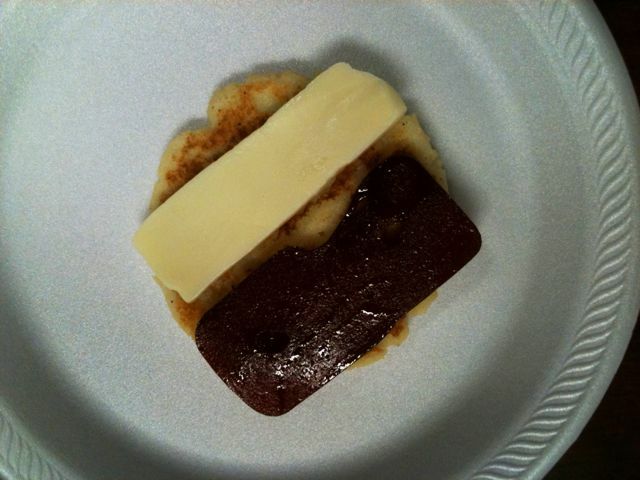 Hot cornmeal pancake, guava jelly, cheese. So good you’re very willing to burn your fingers shoving it into your mouth as the cheese melts and combines with the slab of guava goo. I discovered there’s an impromptu arepa-eria in one of the dorms every weekend. I have a new favorite food and a new favorite spot. Well, certainly not official, but it’s a cute little family (complete with sleeping baby) that camps out and makes delicious stuff. I’ve been plotting how to get the recipe… and excellent idea on the J-term front. An arepa tour of Florida maybe?